ProMat 2019 will gather 1,000 exhibitors to display their supply chain solutions. Here is a sneak peak of some of the companies exhibiting at ProMat on April 8-11, 2019 at Chicago's McCormick Place. Material Handling Equipment Co. Ltd. 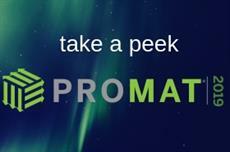 Looking to promote your presence at ProMat 2019? We have a number of options and formats - ask us more.